The DCG50-90 industrial diesel forklift from Kalmar is a profitable investment. This lightweight machine helps you produce more in less time and that translates into larger revenues and higher productivity. You should be able to push your forklift hard, shift after shift, without experiencing any technical problems. It’s as simple as that, at least in theory. In practice, only Kalmar delivers. Ruggedness alone is not sufficient though. You also need high operational performance and useful features to work efficiently in the plant. The DCG50-90 delivers the technological excellence required to meet the demands of even the most skilled operators. A Kalmar forklift delivers, on average,10 percent higher productivity than our previous model DCF50-90. The difference between finishing eleven instead of ten lifts in the same time may seem small. But looking over the year – or over the forklift’s lifetime – it translates into a lot of money. Just like the 15 percent less fuel consumption, which you will enjoy by operating the forklift in Kalmar’s proprietary Eco mode. Like any other part of your production system, your forklifts need to be customized to your operations. And there are many aspects to consider in order for them to perform optimally. 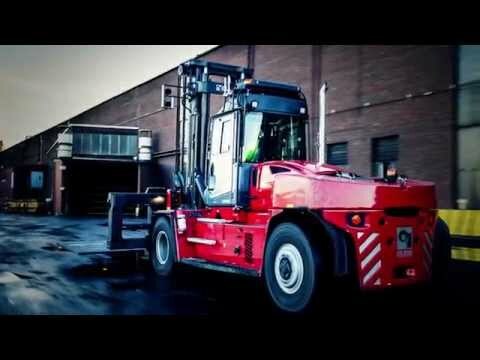 Kalmar is globally renowned for its highly tailored forklifts. The DCG50-90 is no exception. Like its fellow Kalmar G generation machines, it comes with many customizable features. Given our forklifts’ excellent adjustability, it’s no surprise our customers are found in such diverse industries as paper and pulp, wood, steel, concrete, offshore – just to name a few. The forklift can be equipped with any lifting equipment your business may require including pipe clamps, multiple-pallet handlers, coilrams or special tools. The driver can optimize the forklift’s operational performance depending on the actual need for e.g. low fuel consumption or high power output. All from the comfort of the popular EGO cabin – and by simply toggling a switch during operation. The DCG50–90 is packed with smart features that will boost your productivity and reduce the environmental impact of your operations. Choose between 3 different power modes by the push of a button. By using the ECO mode you can lower your fuel consumption by up to 15%. The fan direction can be reversed to remove harmful dust and particles from the cooler and filters – perfect for dusty environments such as sawmills. The DCG50–90 combines robust design with excellent visibility. Choose from a wide range of masts, forks and attachments for different applications. The DCF50–90 is available with either mini-wheel steering or lever steering for precis operation in busy operations. Reliable and environmentally friendly ACGO diesel engines reduce fuel consumption and meet Stage IV/Tier 4 emissions requirements. By optimizing the drive train and the hydarulic system we have improved the productivity with 10% compared to our previous generation. All inspection points can be reached easily from a standing position due to the tiltable cabin.The first service is not required until after 500 hours.